An optimized geospatial workflow platform that improves your efficiency and profitability. 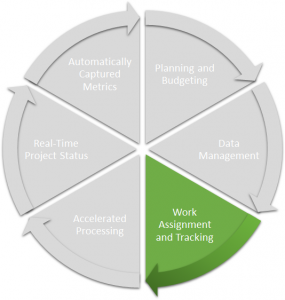 Accurate project planning and optimizing your workflow have always been challenging. Not working toward continuous improvement in workflow best practices, improving efficiency and implementing reliable project tracking metrics can be costly. GeoCue helps you address these challenges by automatically implementing and monitoring your customized workflow while capturing real production metrics that help in both day-to-day production management and in planning future projects. The GeoCue® product family, from GeoCue Group, comprises an integrated set of tools for managing and monitoring geospatial production workflows. GeoCue is a customizable, extendable platform technology, enabling end-users to use with any of their geospatial workflows. Successful companies use GeoCue to plan, track and manage their geospatial production workflows. 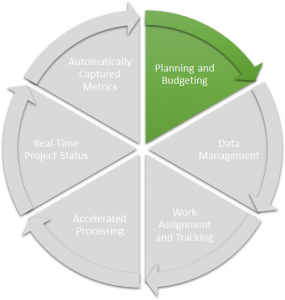 Proactively manage the profitability of your current and furture projects. We believe that you cannot be profitable at the business level if you are not managing profitability at the production task level. Estimating budgets for important tasks at the work unit level, for example editing a tile of LIDAR data or performing QC on an ortho tile or rectifying a DMC™ image, and monitoring performance against that plan are critical to being proactive in hitting cost performance and schedule goals. GeoCue provides the tools you need to automatically manage project details at the task and individual production unit level without overwhelming you with endless spreadsheets of tracking data. Entering planning data such as Budgeted Effort for large data sets is automated by tools that allow you to set work per unit area or unit length. Organize and manage your data across your entire project portfolio and production team. GeoCue manages file-based data in a distributed warehouse system that is accessible by all users and workstations in your GeoCue deployment. Dispatched batch processes and remote users have access to the same data as local users and processes, which dramatically simplifies data management across branch offices and remote contractors. Integrated version control and backup tools reduce risk and simplify the management of all your data across all your projects. Even if you are a one person or small production shop, you will see gains in production efficiency simply by eliminating much the of the manual file management overhead. Eliminate the time spent searching for data! Make quick work of assigning and planning individual task assignments using GeoCue Project Administrator. Designed for Production Managers, GeoCue Project Administrator provides tools for assigning and assessing production management metrics at the work unit (micro) level. Graphically linked to the GeoCue Map View, Project Administrator makes quick work of assigning Budgeted Effort, planning dates and anticipated production workers to thousands of individual work units. Project Administrator also provides tools for exporting detailed project information to Microsoft Excel® for detailed unit level reports, such as individual staff efficiency. Use GeoCue to do a better job of task assignment, tracking and reporting. Substantially increase production throughput, even on small networks. GeoCue’s Command Dispatch System (CDS), allows you to take full advantage of your hardware investment by assigning numerous machines to include create a local cluster (cloud) of processing nodes. With GeoCue CDS you can dispatch batch jobs to run on remote machines or distribute them to a collection of machines for parallel processing. CDS gives you full control of configuring and scheduling each machine in your cluster with built-in robust tools for managing and alerting key staff based on job status. Even a small network of 3-4 machines will provide a 2 to 2.5x increase on project production throughput. Maximize your hardware investment by leveraging all available machines for processing. Easily see the real-time status of your project. 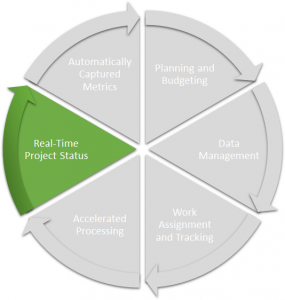 See the real-time status of your project as it moves through your production workflow. Task completion is updated in real time as production staff finish work assignments or flag issues in the project. You can use either the graphical map view of your project in the GeoCue Client or the Project Administrator Dashboard to see the current state of your total project or any component of the project at any given time. Or set-up automatic email alerts to signal when key activates occur or when critical deliverables are ready. Why wait until the end of the week or month to see where production stands? See it now! 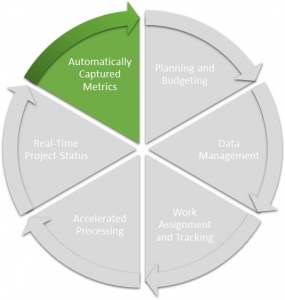 Capture key production metrics without requiring user input. A comprehensive tracking and reporting facility is built directly into GeoCue. Each time a workflow step is executed, the critical elements of tracking processing history such as the user, start time, end time and completion status are automatically recorded along with any user notes or instructions. 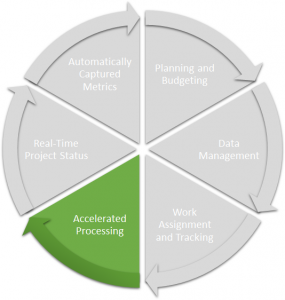 Unlike project tracking systems that rely on users remembering to record their activities in a “side-car” application, GeoCue automates these steps as an integrated part of launching processing actions. All activity anywhere across your project portfolio is recorded and available for review or to drive reporting requirements. Finally, accurate production metrics – automatically!